When Greg and I planned our trip to Europe last Fall, the goal was to pick a route that would hit numerous destinations on our travel bucket list. Near the top of that list was the Amalfi Coast (here, here and here) and Bavaria, in Southern Germany, so we worked our two week schedule around those destinations, adding other locations of interest along the route. 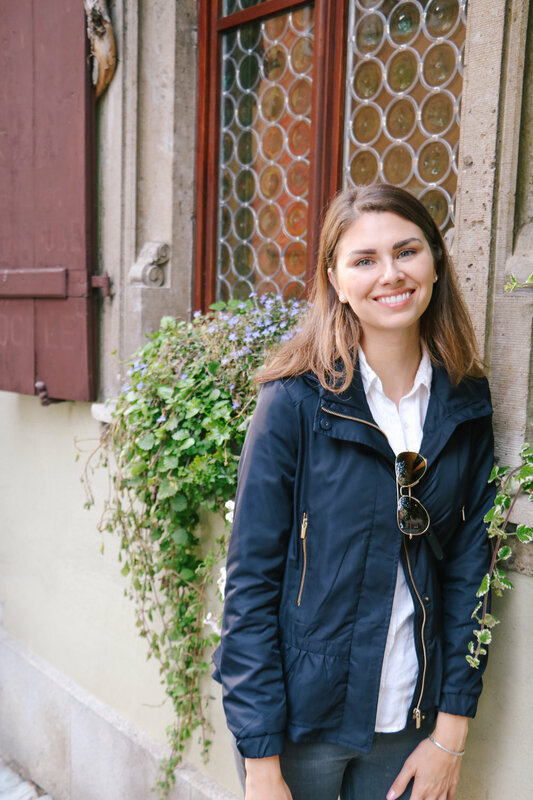 For me, the allure of Bavaria stemmed from visions of driving along the Romantic Road - seeing the Alps contrast against the green countryside, visiting castles like the iconic Neuschwanstein, and stopping in picturesque villages. 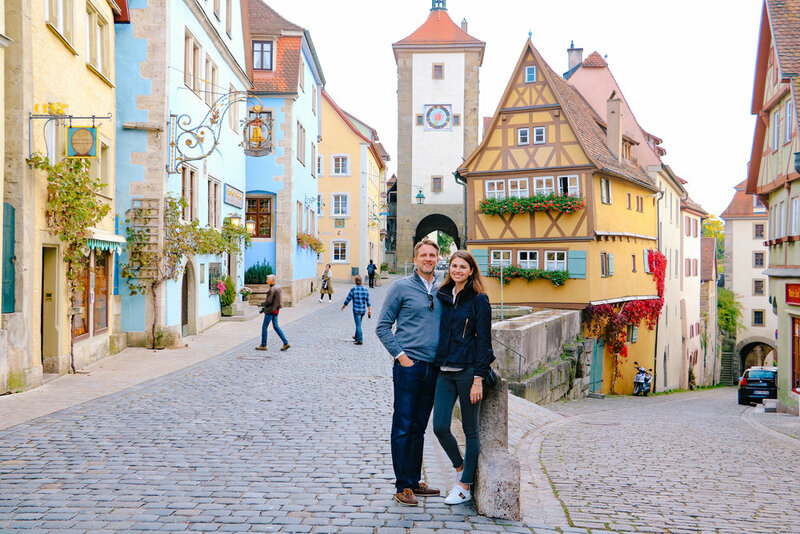 While each town in Germany we visited was full of charm and history, none compare to our last stop of the trip, Rothenburg ob der Tauber - the country's best-preserved medieval town. 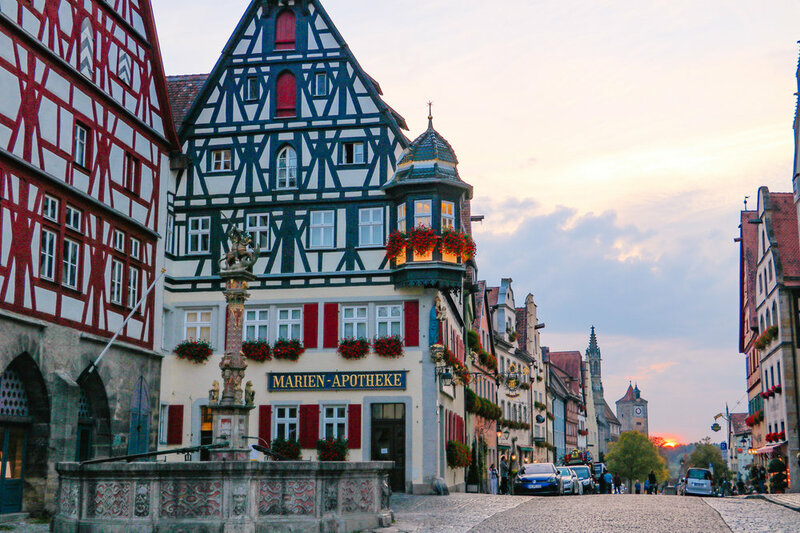 With its cobblestone streets, beautifully preserved timber houses, and ancient fortress surrounding the city, Rothenburg is best described in one word - fairytale! In fact, it's so perfect that at times you feel as if you're on a movie set rather than in a real town. From pictures I had seen prior to our arrival, I knew it was going to be charming, but had no idea how much so! It's a maze of colorful buildings brimming with flower boxes, small shops selling cuckoo clocks and Christmas decorations, and bakeries wafting out the smell of fresh baked pretzels. It's one maze you hope to get lost in forever! Due to a 6 hour driving day, our arrival into Rothenburg was later than we would have liked, which caused us to almost change plans last minute and head straight to Frankfurt where we were flying out of. Thankfully, we decided to power through! As soon as we passed under one of the town's tower gateways, we were immediately transported back in time. 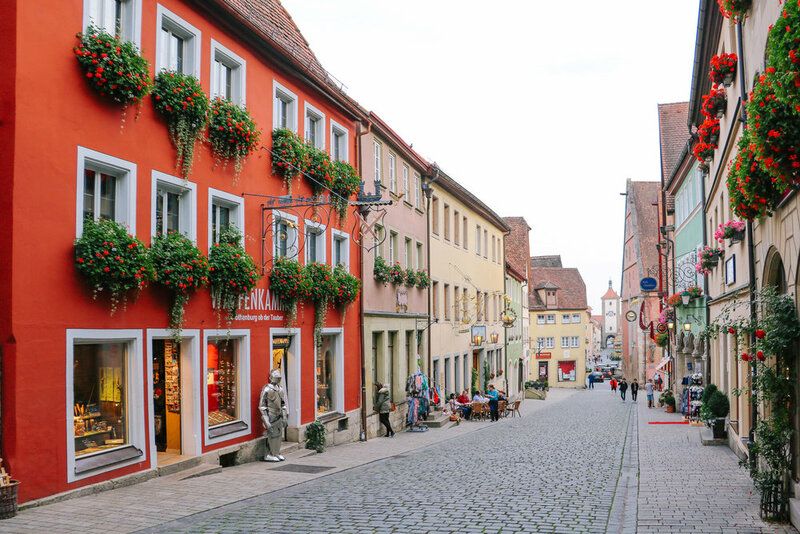 With no plan or agenda, we simply took off walking, discovering the village as we went, which is the best way to experience all the charm Rothenburg has to offer! 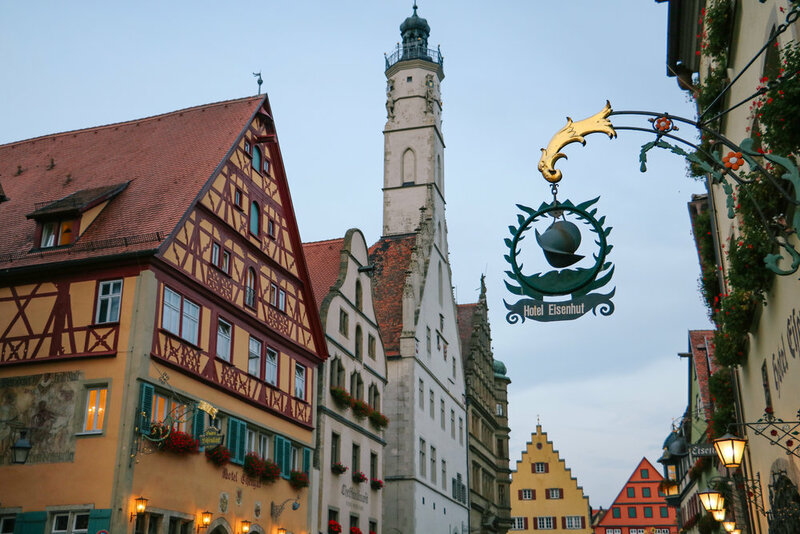 If you're looking to take in some of its "main attractions" though, make sure to climb the Town Hall's 200-foot-high tower which offers one-of-a-kind views of Rothenburg and the nearby countryside, take a walking tour to learn the town's history, and visit the German Christmas Museum. A highlight for us was walking the thick stone walls surrounding the city, which reminds you that you're in a medieval town dating back to 1274. The wall is 1.5 miles long, but if you're short on time you can get the point after walking one section, which is what we did. 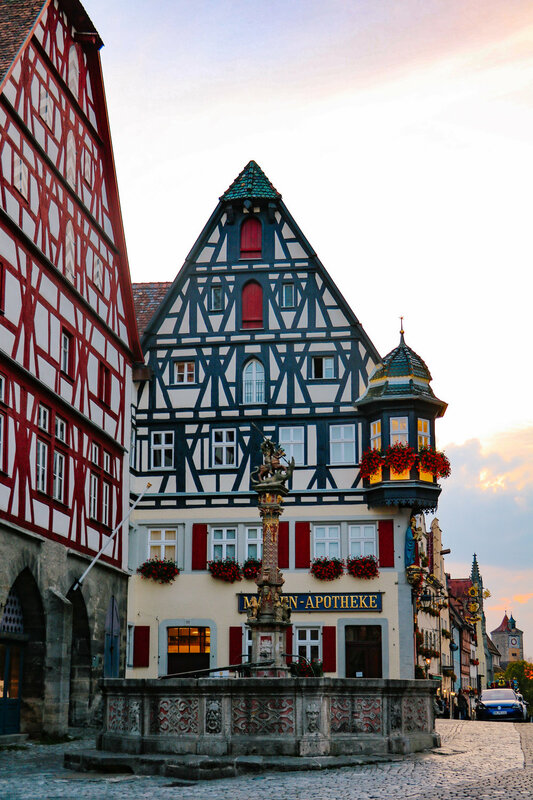 Rothenburg is one of Germany's best shopping towns, selling everything from antiques and beer steins to nutcrackers and teddy bears. Most stores will ship your souvenirs home for you, so no need to worry about your suitcase weighing over 50 lbs! Something to keep in mind if you plan on visiting is that most shops don't stay open late and are closed on Sundays, so plan accordingly. Also, make sure you try Rothenburg's local specialty, a Schneeball - shortcrust pastry rolled into balls and covered in icing or powder. Delicious! The town's not overly large in size, so half a day to a full day is the perfect amount of time here. One of the biggest pieces of advice I can give is to not waste much time exploring the streets near the city gates if you're crunched on time. We were so fascinated by how quaint these first few blocks were that an hour passed before we realized we hadn't entered the heart of the village yet, which puts these outskirts to shame! Head straight for the city center and explore out from there. However, if you have the time and want to experience Rothenburg sans tourists, stay overnight. 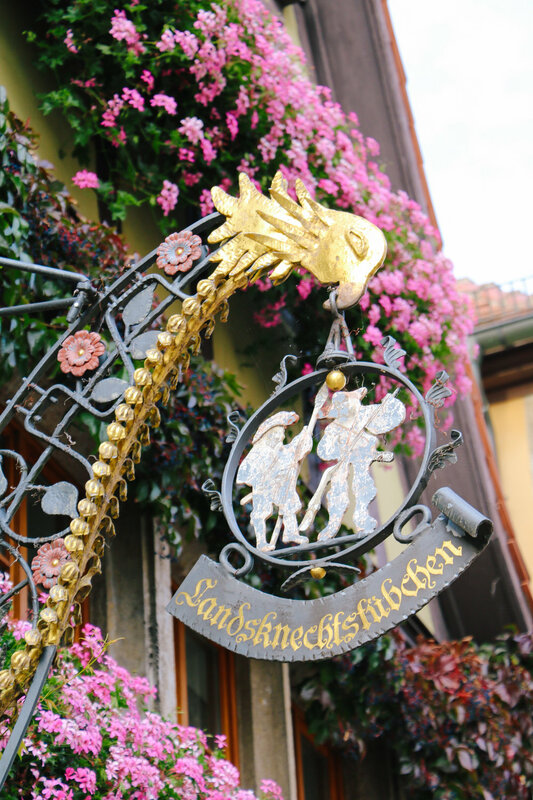 We were enjoying Rothenburg so much that we decided to spend the night once we got there, and were fortunate to get the last room at Gotisches Haus, which is in a terrific location and had large, clean rooms. The town is full of small inns like Gotisches Haus, but they fill up quickly so book a room in advance. If you do stay once the sun goes down, go on the Night Watchman's Tour - the description is in the name and although we didn't go on the tour, we were fascinated by the sight and wish we would have! Even though our time in Rothenburg was short, I am so so happy we stuck with the plan! If you do much research on Rothenburg you'll see the word "touristy" pop up quite a bit. While this is true to an extent, don't let that steer you away as there's so much history and charm allowing for authentic experiences to be had. It's a truly magical place and a must-see if you get the chance! I hope to return one day, especially during the holiday season when it is transformed into one of Europe's best Christmas markets!